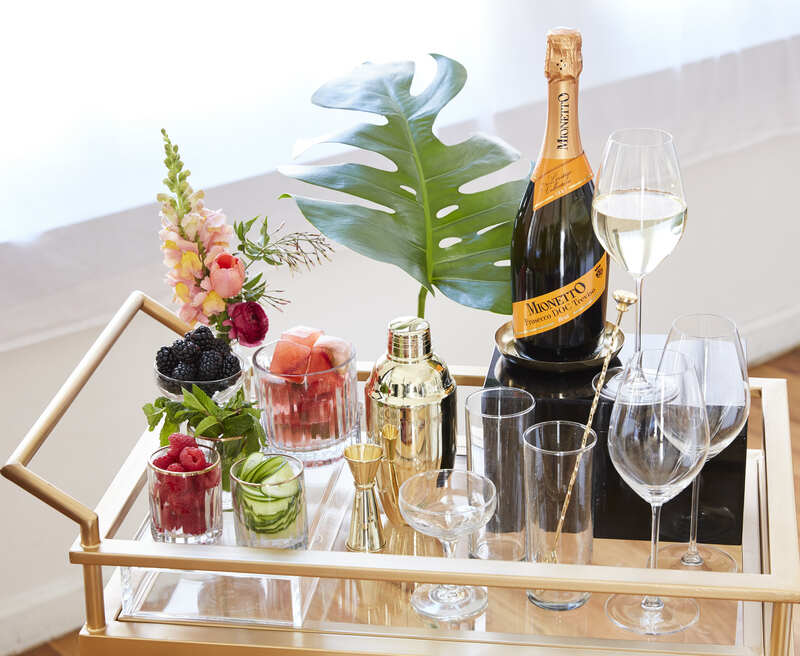 Inspire your guests to get creative with a DIY garnish bar station. Fill the bar with staple spirits like vodka, gin, and whiskey and chill a few bottles of Prosecco on ice, (perfect for pairing with food or adding to cocktails). Add a variety of glassware, mixers and seasonal garnishes like berries, cucumber and mint. Mix in a bowl or two of frozen juice cubes (check out our recipes in the Style Your Prosecco link) so guests can choose their own way to style their Prosecco. Need help planning how much wine to have for your event? Plan on pouring about six glasses of wine per bottle, and serving two glasses of Prosecco per hour, per guest. Although there is no set rule, we prefer to serve our sparkling wine between 40-45 degrees F. Chill the bottle in an ice bucket for approximately 20 minutes before your guests arrive. Remove the foil wrap by pulling the tab. Point the bottle away from your guests! With your thumb holding the wire hood and cork in place, twist the loop to loosen the wire cage and then remove. While holding the cork with your thumb and hand, twist the bottle (not the cork). Avoid the urge to pop the cork and let it release gently so the wine doesn’t come pouring out. While a traditional flute works well to preserve the bubbles in a glass of sparkling wine, the bubbles are only a small part of the experience. The character of our Italian sparkling wine features complex fruit flavors and aromas that show remarkably well in a white wine glass. By having a wider middle section, a wine glass provides more room for aromas to develop in contact with the air, while a taper at the mouth helps to keep the carbonation in. Once a bottle is opened, it should be kept chilled with a bottle stopper to keep the bubbles inside and the wine fresh. Pass More Bubbles and Flatbreads, Please! Because of the bright acidity and the abundance of bubbles, Mionetto sparkling wines cut right through rich salty foods making them a perfect partner for light bites like cheese and charcuterie boards, olives and flatbreads. The flavors in our wines are delicate and well balanced so try experimenting with a lighter fare like sushi, oysters on the half shell and caviar or go bold with spicy Asian dishes.